•Grape skin, Red Grape and berry extracts for cardiovascular and immune system support. Together, these ingredients create a new generation of supplement – one that supports health throughout your entire body. Just a scoop of Argi+ mixed with Forever Natural Spring Water or your favorite Aloe drink helps provide a performance boost to every part of you. 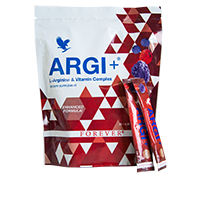 Add optimal health to your family’s diet with the power of L-Arginine!